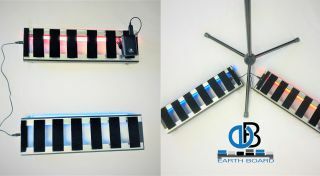 The Lifeline uses the company's patented pedalboard system and adds the new “LifeLine” to connect any number of EarthBoards using the same singular, rechargeable battery circuit. The result is what the company says is the world's first fully battery and magnetically powered effects pedalboard. The company's patented rail system uses magnets and a long-lasting rechargeable battery to secure pedals to the board and provide power.